It’s been a few years since I made my Four Bean Salad with fabric from Allspice Tapestry by Fig Tree… and it’s traveled from Oregon to Iowa for star treatment at Better Homes & Gardens for the 2008 Summer issue of Quilts & More. Such a star… that Four Bean Salad has a celebrity name… Bay Breeze. After years of being lovingly stored in my quilt cupboard… it finally has a loving home to go to. Will it be yours? Read more about it AND how it can be yours AND how you can help Haiti - here at Helping Haiti from the angels at the Fat Quarter Shop. Bid now - operators are standing by. I remember this one…so pretty. How sweet of you to donate it! Looks like it’s getting some good bids! It will be well-loved, that’s for sure! The book behind it though gives me shivers up and down my spine from my childhood! LOL I have the same book, and although it creeps me out and traumatized me as a child (not really) I just can’t part with it. It’s somewhere deep in the storage room…. Das ist so lieb von dir, Monica, und ich hoffe, du nimmst ganz viel Geld ein. 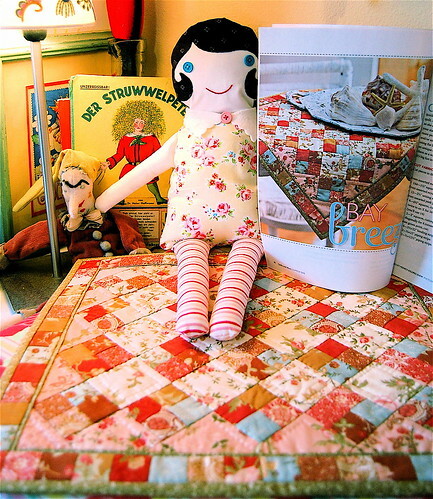 The quilt, the doll…everything looks so sweet and especially the Struwelpeter-Buch. It was one of my favorites when I was a child and I loved all these scary stories in it, hehehe….Wonderful, although I was frightened to death when my Mama told me the story of the little girl that burnt. Oho…I´m frightened until now!! Have a lovely day und ganz viele liebe Grüße schicke ich dir!!!!! Thank you for your generosity! I love that quilt! And that darling little quilt made a tidy sum for charity! Congratulations! It was me…I’m so proud to receive this quilt…your work is exceptional and you humor is wonderful. I really enjoy your blog and the projects you share with us all. Your quilt will go to a good home to be treasured and loved…. congratulations on being mentioned in Quiltmaker as a “blog to watch” on page 14 of the latest issue.